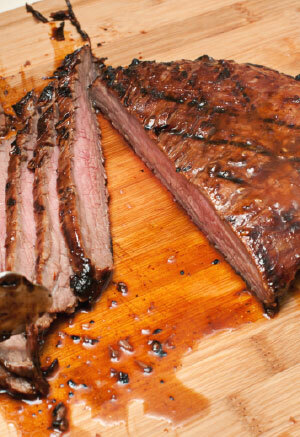 Brush the flank steak on both sides with 2 tablespoons of the olive oil and season with the salt and pepper. Place on the center of grill and sear 5 to 8 minutes per side for rare to medium rare, testing by pressing the meat with a finger: The spongier the meat feels, the rarer it is cooked. Remove from the grill and allow to rest, very loosely tented with aluminum foil, 5 to 10 minutes, to allow the juices to reabsorb into the meat. Juan and Elisa established Bodega Bouza in 2000 by restoring a historic winery first built in 1942 by Numa Pesquera. Since then the winery has established itself as Uruguay’s most critically acclaimed producer. Grapes are sourced from Bouza’s two estate vineyards in the Canelones region. This temperate, Atlantic-influenced climate sees four distinct seasons and temperatures rarely exceed 93 degrees. While Bouza is receiving worldwide attention for their Tannat bottlings, the winery is also responsible some of the most interesting Tempranillo, Merlot, Chardonnay and Albarino in South America. This entry was posted in Recipes and tagged bodega bouza, canelones wine, cooking with wine, flank steak, food pairing, grilled steak recipe, premium wine club, recipe, uruguay wines, wine, wine club, wine pairing, wine recipe, wine tasting, winestyles. Bookmark the permalink.